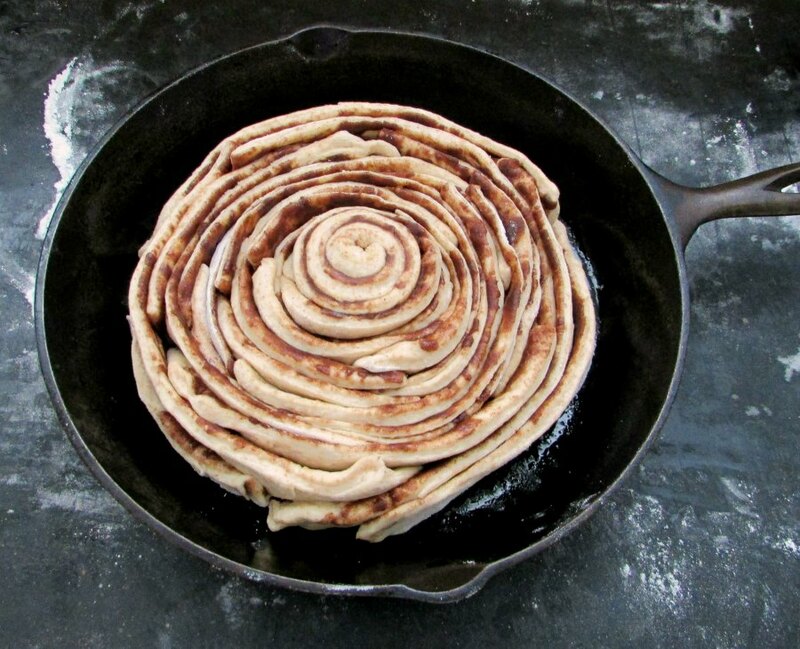 One giant cinnamon roll is a perfect way to serve breakfast or brunch. Cut a small sliver or a big slice and you still get all of the layers. This super giant whole wheat skillet cinnamon roll is a favorite! 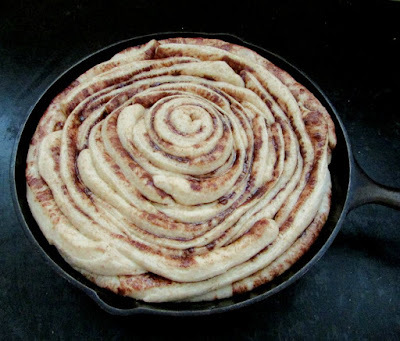 I have been seeing some really cute ways to do cinnamon rolls in skillets. Some look like roses. 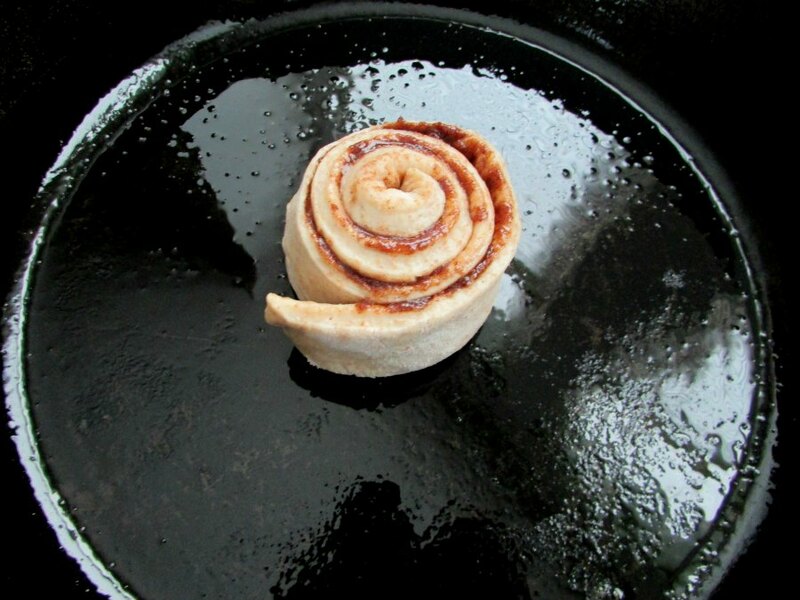 Some are folded over on themselves and placed in the skillet so no cinnamon shows, it's like a surprise inside. I had to get in on the action. I mean any excuse to make cinnamon rolls is a good one, right?! It really is quite easy. Be warned, the dough is still pretty loose after the knead. That is ok. The whole wheat flour just takes a little while to hydrate completely. By the time the first rise is done, you will be amazed. It was actually really easy to work with. I didn't need a rolling pin to form my rectangle. Just thirty seconds and a few nudges with my finger tips. But it wasn't sticky at all. I didn't flour my fingers, just the counter... no muss, no fuss! 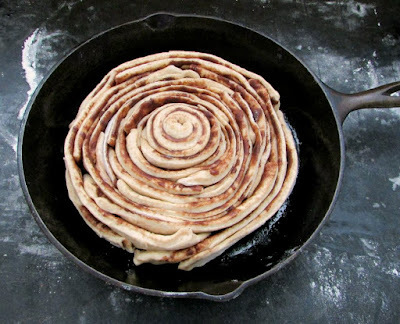 Spread the buttery, brown sugar and cinnamon mix over the dough and cut into strips. Start by rolling a strip to make the center. Then keep adding strips until you run out. Allow to rise until doubled in size (or wrap in plastic wrap and place in the fridge over night). After the second rise, bake it up! Then drizzle with glaze and enjoy! Mix the flour, sugar, salt and yeast in your mixer bowl. Add warm milk, butter and egg. Mix until completely combined. 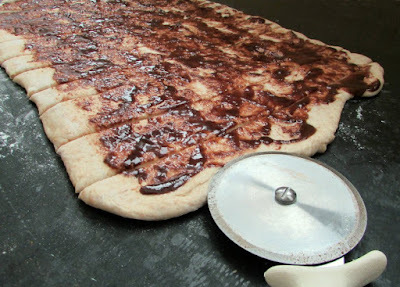 Scrape down sides, then attach your dough hook. Allow it to work the dough on low for five minutes. 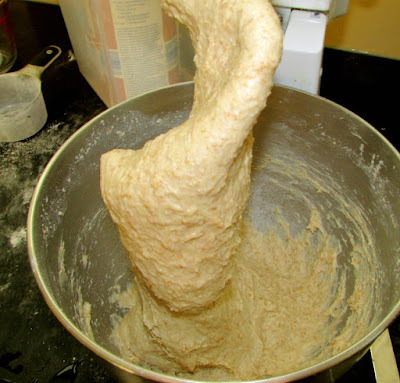 Transfer dough into a greased bowl and cover. Let rise in a warm place until doubled in size, about an hour. The dough is ready when you touch it and the indent stays down. Pat out into a 12 x 20 square on a floured surface. Mix together melted butter, brown sugar and cinnamon. Spread over dough. Cut into two inch strips. Tightly roll the first strip and place in the center of a greased 12" cast iron skillet. Add the rest of the strips in circles around the center. Let dough rise to double again. You can let it rise on the counter for another hour, or in the fridge overnight. Mix together powdered sugar, milk and vanilla. 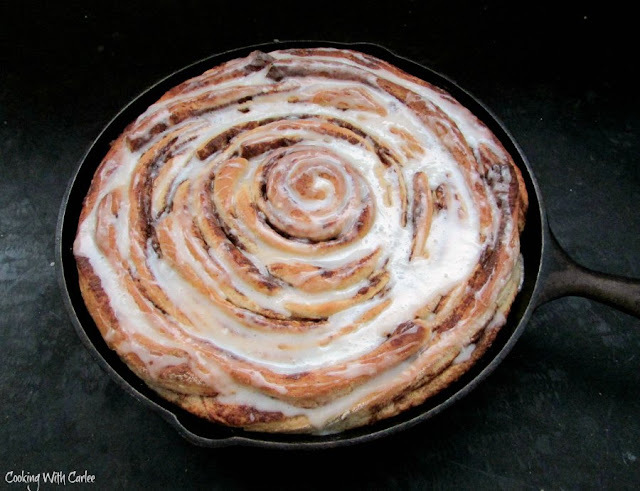 Drizzle glaze over hot cinnamon roll. Allow to cool slightly, but it is best served while still warm. YUM! Jaxon is one lucky little guy! This looks delicious - and just in time! 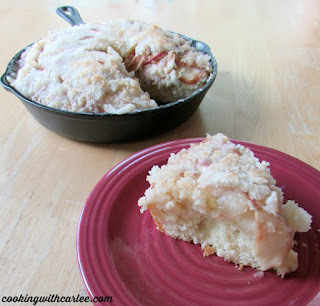 I'm having company this weekend and this would be a perfect breakfast treat. Pinning for sure! I hope you enjoy it! 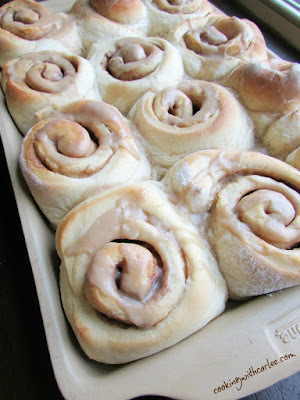 It definitely has the WOW factor for company, but really is no more work than making regular cinnamon rolls. Oh my goodness! This looks divine!!! Thank you so much for sharing on MMM! PINNED to make! Oh my, my mouth is watering! I've pinned. Thanks for hosting! It is always fun to see what you have going on! Pinned! Stopping by from Making Memories Monday. Thank you for coming by! This one is yummy and eye candy as well! 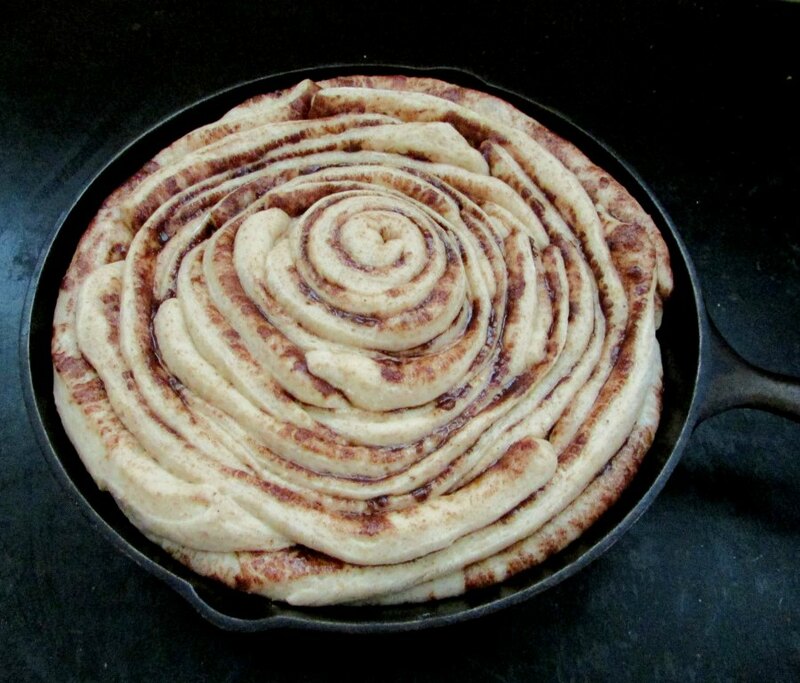 I can't wait to try your Super Giant Whole Wheat Skillet Cinnamon Roll. I have never seen one like this........I bet it is delicious. It was really good and fun to eat each piece layer by layer. Thanks for hosting! This looks amazing! It's featured this week on Funtastic Friday. Thanks for linking up and sharing with us. Hope to see you again this week. Thank you so much for hosting and featuring this cinnamon roll! Have a wonderful weekend! Oh my, you are right! Thanks for catching that. I will fix it. You do let it rise again in the pan before you bake it. This looks so so yummy! Gotta love a cinnamon roll. Thank you for sharing at Snickerdoodle. Hope to see you again tomorrow! Thank you! We really enjoyed it. Thanks for hosting! Wow!! I want one...this looks delish! Thanks for sharing on My 2 Favorite Things on Thursday - Link Party!! Hope to see you again tomorrow!! Love having you!! Pinned!! Thanks! We really enjoyed it. I already have a few fun variations in mind that I would like to do! What a great recipe, it looks awesome! Hope you are having a great week and thanks so much for sharing with Full Plate Thursday. Thanks, Miz Helen! I hope you are having a great week too, see you tomorrow! Looks fantastic but when I went to make it I couldn't find a measurement for sugar for the dough. The instructions say to mix the yeast and sugar etc but when I went to the list of ingredients it wasn't there. Am I seeing things?! How much sugar does the dough call for? Help! Oh my goodness, you are right! I skipped it in the ingredient list. It should have said 3 T sugar. I fixed it. Thank you so much for letting me know! You probably already know that this was featured at Diana Rambles last week. I'm just getting around to letting you know now. It looks delish! Thank you! It really is very good. I get to make another one soon. My little sister saw this while she was away at school. She comes home tomorrow and has already requested one! It was pretty and fun to eat layer by layer! We really enjoyed it! Am I missing it or is there a button to print this recipe without having to print the entire article? I realize I could also copy and paste into a Word program, but I was just hoping to go the easy route. I'm sorry, I don't have a recipe plug-in that makes them printable. I will keep my eye out for one that works on this platform! Usually what I do (because, I find myself printing my own recipes sometimes!) is highlight the recipe, right click and print the selection. I hope that helps in the meantime, but I promise to look for a better way! Hello brunch-time fun! This sounds and looks amazing! 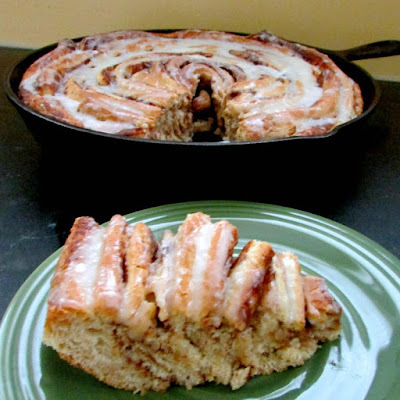 And since I only use whole wheat, this recipe is perfect for us. (Nice too that you can prep it ahead and put it in the fridge overnight). And what a great presentation! Thank you! We've tried a few different variations of this idea and they have all been really good. 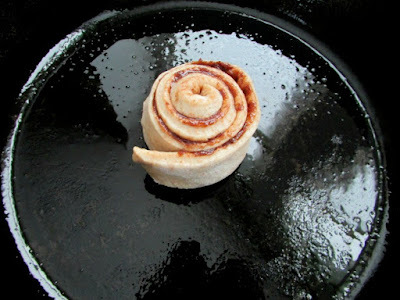 This classic cinnamon roll is my favorite though! Dang, Carlee, this is super amazing! 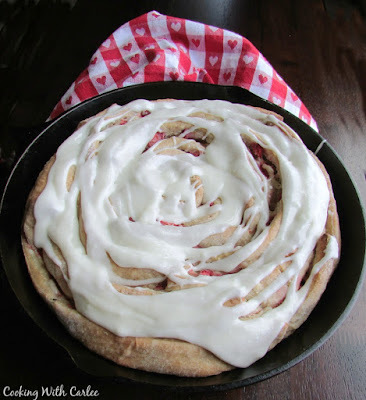 I've never thought of a giant cinnamon roll and now I can't stop thinking about it! lol! Thank's Molly! I've done a few variations on this over the past year and there are so many more I can't wait to do! And While I'm thinking about it, I'll just take one, please. And thankyou! Stop on by any time, I'd be happy to make one for you! Don't feel bad eating it, we can always make another! You totally do need a skillet though, I use mine for everything! This looks Ah-mazing! I'm certain it would be a hit in my house! 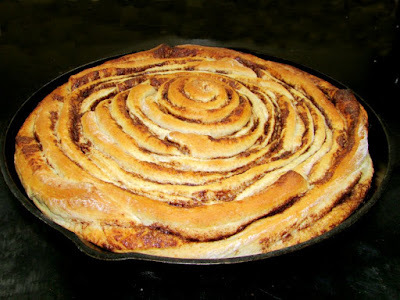 It is so much fun to have one giant cinnamon roll! Thanks, Ellen!